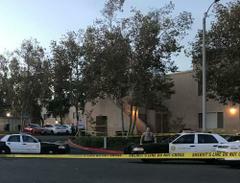 Los Angeles County Sheriff's Department Homicide Detectives are continuing their investigation into the circumstances surrounding the deputy involved shooting that occurred in the 21300 block of Bottletree Lane, Santa Clarita. Investigators learned on Wednesday, November 28, 2017, at 10:05 p.m., deputies were dispatched to an “Assault with a Deadly Weapon” call. Further information in the call revealed that two male Hispanics were seen in the area. One of the suspects approached the female victim, who was parking her vehicle, and pointed a handgun at her. She retrieved her cell phone to report the incident and the suspect fled near the pool area of the apartment complex. 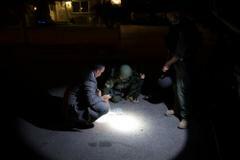 When deputies arrived on scene they contacted the victim and began a search for the suspects. One of the suspects, who was located in the parking area near the pool, fired his handgun towards the deputies and a deputy-involved shooting occurred. Four deputies were involved in the incident, one of which suffered a gunshot wound to the neck. The injured deputy was transported to a local hospital where he remains hospitalized in stable condition. The suspect, a 29-year-old Hispanic man was struck at least once in the torso. He was transported to a local hospital where he is currently in surgery and his condition is unknown. The second suspect, a male Hispanic juvenile, was found in one of the apartments and was detained. He is being questioned by investigators to ascertain his involvement in this incident. He has not been arrested at this time. A handgun belonging to the suspect was recovered at the scene. No other deputies were injured. Whenever a Deputy Involved Shooting occurs involving Los Angeles County Sheriff's deputies and it results in the wounding of a suspect, multiple independent investigations immediately begin at the scene. These include separate investigations by the Sheriff's Homicide Bureau and Internal Affairs Bureau. The Los Angeles County Sheriff’s Department immediately notifies the Office of the Inspector General who sends a representative to the incident scene and provides independent oversight throughout the investigative process. The mission of the Office of Inspector General is to provide strong, independent and effective oversight of the Los Angeles County Sheriff’s Department and to ensure transparent, accountable and constitutional policing for the County of Los Angeles. The Critical Incident Review panel convenes to perform a preliminary risk management analysis of the shooting. This panel is comprised of the concerned chief and unit commander, risk management and training personnel, the chairperson of the Executive Force Review Committee, and a representative from the Office of the Los Angeles County Counsel. Every aspect of a Deputy-Involved shooting is ultimately evaluated by the Sheriff’s Executive Force Review Committee, which determines whether there are any policy, tactical, supervisory, or training violations or concerns. The Office of the Los Angeles County District Attorney also participates in the investigatory process and conducts a legal analysis of the shooting. Los Angeles County Sheriff’s Department Homicide Bureau detectives are responding to the 21300 block of Bottletree Lane, Santa Clarita, to investigate the circumstances surrounding a Deputy-Involved shooting. A deputy was struck by gunfire and transported to a local hospital. The deputy is expected to survive. A suspect was struck by gunfire and transported to a local hospital. His condition is unknown. There is an active containment of the scene for a possible additional suspect.